Each year, about one in 33 babies (or 3 percent) is born with a serious birth defect (CDC, 2012). A much larger percentage will develop a serious condition or disorder before reaching the age of 18. One of the most common conditions—mental illness that significantly interferes with daily life—will affect 20 percent of American children within a given year (National Institute of Mental Health, 2010). In 2008, a total of $114.5 billion was spent on all conditions for children; $12.2 billion was spent on mental health for children under the age of 18 (Agency for Healthcare Research and Quality, 2009). When a child is involved, all medical stops are pulled out. Fortunately, while financial costs may be high, effective treatments and therapies exist for many childhood disorders and conditions. But what is the emotional toll on the family? 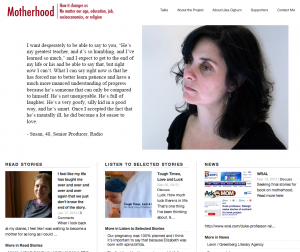 Six stories of mothers whose experiences with motherhood haven’t followed the more predictable, and often taken for granted, path of good health, are currently on exhibit at the School for Public Policy at Duke.